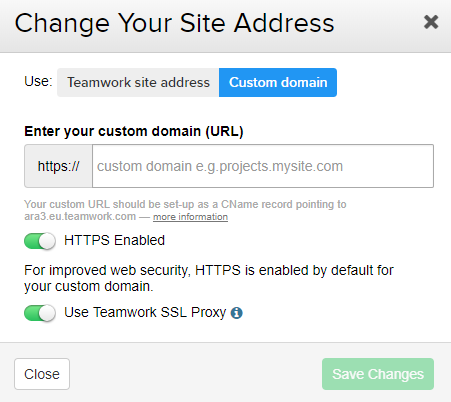 Within Teamwork Projects, you can enable HTTPS on your site's custom domain. HTTPS is provided on all accounts by default. If you are using a custom domain, you can also enable HTTPS for that address. To enable HTTPS on your custom domain, select your profile image to the top right and select Settings from the dropdown. 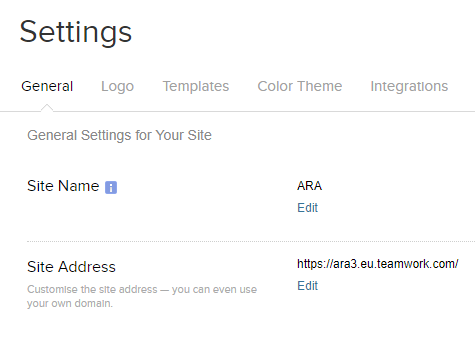 In the settings area, go to the General tab, and under Site Address you can chose your custom domain and follow the steps to enable it. If you have one enabled already you can edit this. You can choose to toggle https on or off on your custom domain. When creating a new custom domain from the same location, you will be asked to create a CNAME DNS record so you will need to access the control panel where your domain name is hosted to make the necessary changes. Once the CNAME is in place, our system will detect the change in your account and enable HTTPS automatically. It is possible to apply HTTPS to your custom domain using your own Cloudflare account. If doing so, please disable all speed or compression enhancements Cloudflare provide as this can interfere with the process of HTTPS on custom domains. Note: Changes to CNAME records can take time to propogate so it is advised to do this outside of our regular works hours, to avoid disruption. If the site isn't working for any reason, or you have further questions on this process, contact support@teamwork.com.